Bonus info: Out of these three authors there are two who's queer. 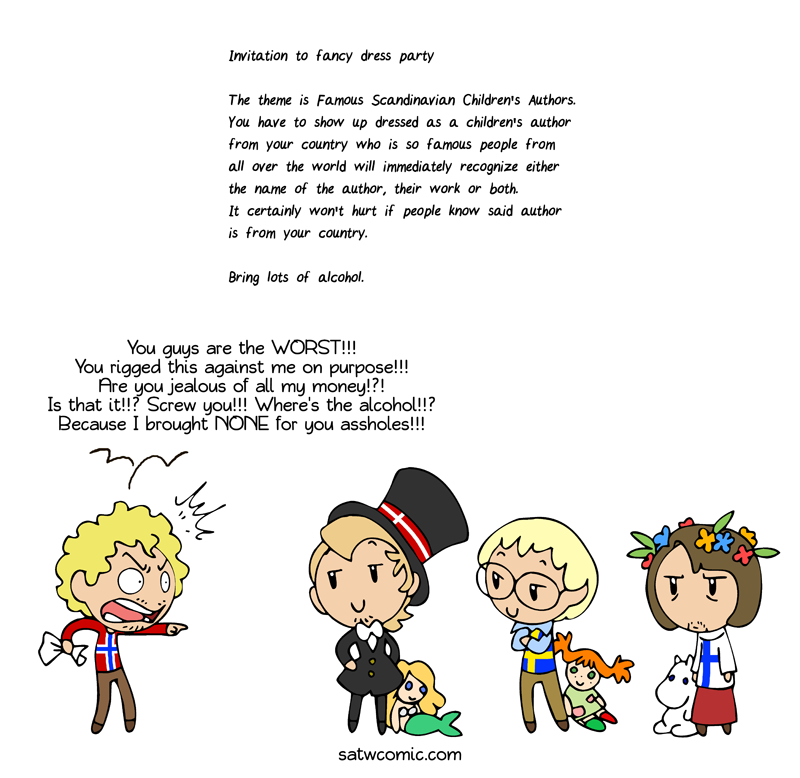 Hans Christian Andersen was bisexual and Tove Jansson was lesbian. 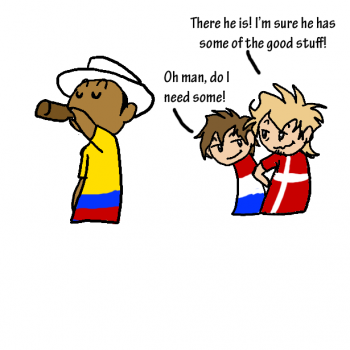 Never Ask Colombia Again For That! And no-one's making fun of Finland in drag. Not because of progressive ideals, but because getting an axe in the face is something of an inconvenience. Axe? Is that what you're into nowadays up there? A good ol' knife can't do it anymore? @BrianneOfTarts Some variation of weapons is good to keep things interesting. Finland is known to master knives, bottles, hockey sticks and sniper rifles. @Rogers And Nokia phones, yes, as weapons too. @MagicRooster only 3310. Later phones are much less brutal, and updated pseudo-3310 is an abomination. @comrade_Comrade Nokia 3310 is classified as a weapon of mass destruction so the Finns had to stop making the real deal. It's not as they realy needed it to be scary anyway. @Rogers I have 3310 and not afraid to use it. Motorola MicroTac too. It's less sturdy, but looks far more intimidating, very useful for misdirection. @comrade_Comrade If things get realy dangerous I can borrow my grandpas Ericsson Hotline type 2102. It takes some strength and skill to wield but it's effective and can be used as a shield and flail in combat. @Rogers I have US Robotics Courier, it can be easily used as tower shield. @photondancer remember that time when computers already had CPUs, but still could be cooled by a small passive radiator? Those were fun times. @comrade_Comrade Dang it you all know too much. Calling the army: Abort, abort, we've been compromised! Need more knives! Ah yes I read that and it's so sad, a 3310/3510 could even be burnt and still worked (mine did) now you have to use a "antichoc smartphone". I imagine we can see it as a super-power, you know, being able to charge Nokia with a psykokynetic energy. @MagicRooster original 3310 was built like a tank - very thick PCB, massive plastic enclosure, no wimpy ribbon cables, and I think it was made back when it wasn't required to use leadless solder. For all but extreme (for a phone, of course) forces it's as good as solid plastic brick. Doesn't have any protection from water or dust ingress, proper "mil spec" phones will always have advantage of being dust- and water-resistant. New 3310 is less solidly built (well, at least it won't bend like iPhone 6), and it's specs are way more limited compared to current generation of phones, while original was close to full feature set for it's time. It just looks like it's only place in current market is a throwaway cheap phone, for which any durability wouldn't be an advantage. In that case it competes used phones that are sold at similar price, but have better specs. @Rogers Fiskars makes axes. Whether they're good or not is an open question, but warranty should cover any damage that splitting maul would take from going through someone's face. @comrade_Comrade I've always found Fiskars axes great! Splits an orc skull--- err, a log with ease. @Rogers I'll suggest the Lahti L-39. That'll sting a bit if you survive the hit. @BrianneOfTarts Hey, gotta go with the times, man. Axes are all the rage these days. @DarkMage7280 Wait, you are telling me you are not wearing drags? Norway does have Thorbjørn Egner, there is not a child in Iceland who does not have at least seen some of his work, like Dyrene i Hakkabakkeskogen, Karius og Baktus, and others. @Sulta - I'm thinking of Thorbjørn Egner too, but I believe he's mostly (if not only) famous in Scandinavia + Iceland. Also, even though his works are amazing and I love them to death, they're nowhere as famous as the other three. Well, he's a good candidate. Famous in Scandinavia at least. (Though I had forgotten he was Norwegian). I saw someone else in the comments mention Thorbjørn Egner as a possible Norwegian candidate as his works (such as "Karius og Baktus", "Klatremus og de andre dyrene i Hakkebakkeskogen", and "Folk og røvere i Kardemomme by") are pretty big in the other Scandinavian countries at least. I'd also like to put forth Jostein Gaarder, who wrote Sophie's World. It's aimed at a slightly older demographic, but tweens and teens are technically children... I loved that book as a child (still do), and it was a great introduction on so many philosophers - so great that excerpts of it were used in my high school philosophy class. @Gaya Sophie's world is still one of my absolute favourite books ever and the only book I've brought with me whenever I study abroad as it is the only book I can keep rereading and still get new ideas and insights from with every new read). There is Alf Prøysen, though he might not be famous all over the world. There is however also Jo Nesbø who has been translated into over 40 languages and sold more than 3 million books in Norway alone. While he is most famous for crime and thriller novels, he is technically a children's book writer as well, as he has written children's books. If not, we shall borrow Roald Dahl. While he was born in Britain and as such is technically British, both his parents were Norwegian and he even spoke Norwegian as his first language, that is when at home with his parents. So while born a Brit, and even fighting in the RAF for the Brits during WW2, well, by most Norwegians he is more or less regarded as a Norwegian. He is so Norwegian, even his name being Norwegian, that he must qualify, surely? @Torbk : Roal Dahl, good idea. I didn't thought about him. but which will be his most famous work you might recognize at first sight? @Belgianfish Perhaps Willy Wonka. Or the BFG. @Belgianfish Heksene (The Witches)!! 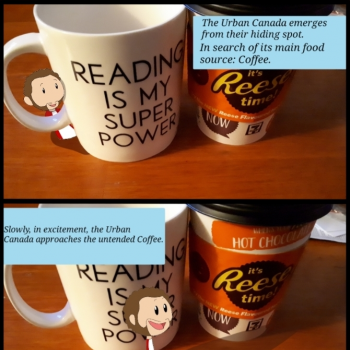 I LOVE that story! It was mainly my dad who read to us when we were small but my mum and I read the Witches over and over again because we both had a thing for witches and such. @Belgianfish Probably Charlie and the Chocolate Factory, but there is also Mathilda or Big Friendly Giant. The most easily recognizable character might be Charlie, in classic poor boy outfit, with the golden ticket. Almost everybody knows the poor boy with the golden ticket. I have a thing about Finland; he's the cutest. @Asturias just dont start making fanfic! @Asturias This is the first time I find someone Spanish on SatW. Sorry i just had to comment it's so rare. You've just made the best drawing i could imagine of Finland ever! @greenlandicfangirl You should know that the manliest of men always wear dresses. @marce If you do see the Disney version again. Note that they actually wanted to do the original. There is a moment the story cuts abruptly from the original to the Disney version. When Arial is sitting at the pier and would die in the original, she gets saved by the Disney sidekicks in the movie. Just stop the movie there and you have the original. P.S: Isn't "Arial" a type? @marce oh you mean the original version? @EirikTrollet RD is Welsh. No idea why you thought he was team Norway. "Moomin is probably the most known and adored Finnish icon, if not before, then right after Santa Claus." "The white, hippo-like Moomins are Finnish literature characters created by the much‐loved Swedish‐speaking Finn, writer and artist Tove Jansson in the 1940’s. After the initial success of the comic strips and books, Moomins grew into a world-wide phenomenon through puppet animations and Japanese-style cartoons. Today the Moomins adorn the wings of Finnair (The Official Airline of Moomins), the iconic mugs of Arabia and high-quality bedding of Finlayson, to name a few." "The Moomins are not only adventuring in literature, animation, and merchandise or in films, music and theatre shows. In Finland, the Moomins have their own hotel rooms like the Naantali Spa Moomin Story and theme parks such as The Moomin World in Naantali. They also have their own Moomin Museum in Tampere and numerous gallery and museum exhibitions around the country every "
@finnhare Thank you. I'm sorry to say that I had never heard of Moomins until now. I feel as if my childhood was deprived of something special now. So the resident gay guy is the only one dressed as a straight author,eh?